Middle school can be a tough age, and this building provides our students with their own space—a place where they can build their own community. Design a 'future-forward' middle school that considers long-term adaptability, environmental stewardship, and students' development toward becoming actively engaged global citizens. Maximize the school's lean budget to provide a range of spaces where students can socialize and work independently. The L-shaped building hugs the wooded campus edge, evoking the idea of a 'nurse log,' a fallen tree limb full of nooks inhabited by different critters. 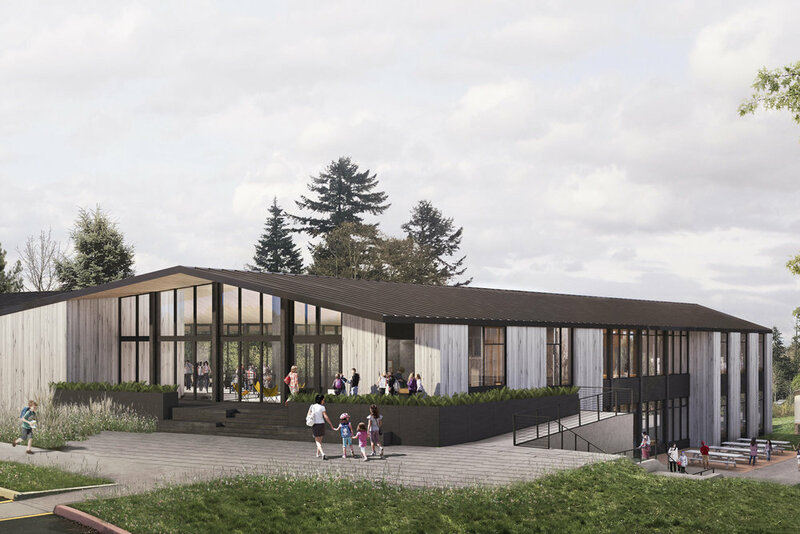 The building placement on the site takes advantage of both the natural beauty and the educational opportunities offered by the forested campus. Classroom wings are joined by a social hub where students can gather for lunch or special events. The project improves connectivity among the whole campus with the creation of a pedestrian street, amphitheater, outdoor dining facilities, and a new trailhead deck leading to forested trails.